What is Scorpio you say??? Scorpio is an American style Stout with pumpkin and cranberry sauce. We filled this brew with all the good stuff for the season! A rich and flavorful malt bill gives this stout-ish brew roasty, chocolaty, and mildly sweet cocoa flavor. 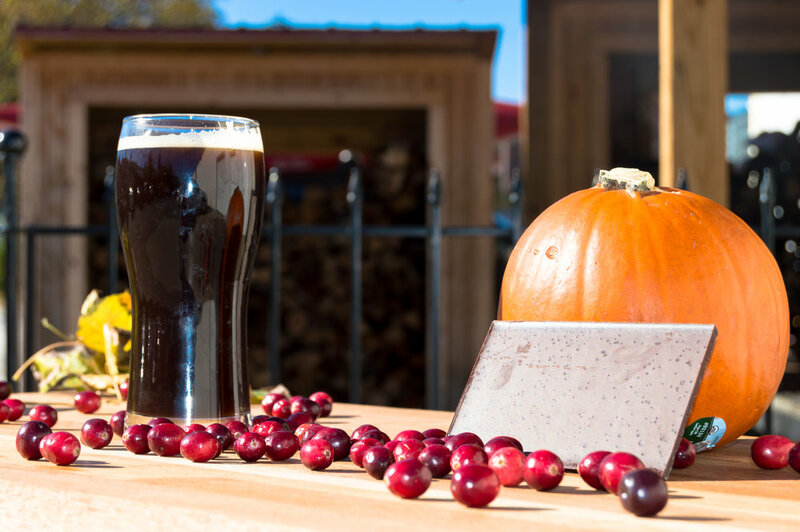 The pumpkin added in the brew kettle lends an extra kick to the ABV and the brewers added a house made jellied cranberry sauce puree to the fermenter. To really bring those festive flavors out a natural cranberry flavoring made with REAL cranberries was added to the brite tank. These seasonally tasty additions impart a slight, cranberry tartness, and a memorable but mild sweetness to this brew. New Beers + Spring Beer Features! You know you love Au Sable RyePL -- it's a staff favorite around here, too! Rye takes center stage in two ways here: first, by adding a touch of spiciness to the flavor of the brew and secondly, by creating an ultra-pleasant, somewhat slick mouthfeel. Au Sable is rounded out with a big beautiful hop bouquet with late-addition Cascades taking center stage. This is an utterly quaffable brew, as complex and inspiring as the river for which it is named. Next up: Carcajou Rye Lager! Like Au Sable, this is a brew that features spring-appropriate zippy rye, but in this case, the rye is accompanied by a really fun grain bill that includes additions of honey malt and oak smoke. What you're left with is a multi-layered drinking experience that is perfectly balanced by just the right amount of Northern Brewer hops. Quickhatch is our brown lager aged AND fermented in third-use bourbon barrels. What do we mean by all of that? First off, you don't often hear about aging AND fermenting happening in bourbon barrels. We do it because we love the soft vanilla and oak character that the barrels imbue the beer with. Before Quickhatch went in for a long sleep in them, these barrels were occupied by 2016 Massacre. There's juuuust enough bourbon left in the wood to make our Quickhatch deliciously soft, complex, and oh-so-flavorful. Quichatch is April 2017's Beer of the Month, so be sure to come see us on Mondays for $1 off 15-oz pours. Faustian Baltic Porter is our big booming Baltic brew featuring an awesome, complex grain bill -- in addition to a ton of Munich malt, you'll find oats, chocolate malt, and roast barley malts in this smooth operator. Rich, complex, roasty, and slightly sweet, Faustian will make all your Baltic Porter dreams come true. Last but not least, we have a brand new beer to tell/tease you about. It's called Wheelbarrow Weekend, and it is going to be GOOD. This Radler (yep, you read it right) features a sunny, vibrant, golden body with a touch of fresh-squeezed lemon juice to give it a zippy, refreshing flavor. This brew is absolutely perfect for the long spring and summer days ahead. We'll update you when we're close to releasing it! Who loves fall beer releases? WE love fall beer releases! And we've got a couple of dandies for you thirsty beer lovers. First up is our November Beer of the Month, Kurios Black Belgian Stout Lager. Created with a rich base of Pils, Chocolate, and Midnight Wheat malts, Kurios Black gets a special edge from Saigon cinnamon additions, Belgian candy syrup, and tart, tropical hibiscus flowers in the boil. But then...then. We aged this bad boy in bourbon barrels for A WHOLE YEAR. A whole year spent quietly maturing in bourbon-and-oak paradise, deep in the far reaches of our cooler. Need more? After all that, we finished it off with Michigan tart cherry juice. Mmhmm. It is dark, rich, complex, and so very intriguing. One could even say it is quite...curious. Get it til it's gone, but especially in November, when it's yours for $1 off every Monday. Hunger in the Hunt Triple IPL is finally back! This huge beer is brewed with four different hops (Cascade, Chinook, Warrior, and Columbus), and oh boy, is it juicy-fresh and delicious. The last time we made this, we barely caught our breath and it was gone, gone, gone! So if you were despairing the end of hoppy season with the arrival of cold air, fear not: this is one hop monster that will keep you warm and toasty at 11%+ abv. Later in November, another delicious iteration of our Session IPL, Green Thumb -- this time, Nelson Sauvin hops are front and center. This New Zealand varietal is prized for its distinctive flavaroma of passionfruit, crushed grapes, and white wine. New Zealand really has a lock on these bangin' hops, and we can't wait to finish this one up and get it into your glasses. Last but certainly not least, everyone's favorite German Pilsner is set to return in November! Smooth, drinkable, and refreshing, Barenmarder German Pils also features a hop backbone that keeps it crisp and zippy. Grab a pint with a hot pretzel + brown mustard for an "authentic" German experience. We'll keep you updated with release dates as they approach! Until then, prost! Happy back-to-school! The leaves are starting to turn (out of nowhere!! They were green yesterday! ), the air is...hot and stifling, and cider doughnuts are on the menu. Yep, it's September in Michigan. We've got a lineup of great beers coming your way to help celebrate fall. Please fasten your seatbelts -- this plane is officially taking off from summer land. First up: the brews you remember from years past. Split Sky Rye and Oat Milk Stout Lager (aka "damn, that's a mouthfull" beer) will return in the coming weeks. The rye base in this beer gives some spiciness to the body, while oats create a smooth mouthfeel, which is further smoothed out by adding milk sugar to the brew. It's malty, smooth, and roasty. Remember how Insolent Mink came back last year, but reincarnated as a lager? You don't? That's okay. Insolent Mink used to be an IPA way way back in the early days of Wolverine State until last year when Oliver saw the light and remade it into an IPL. It's "hop bursted," which means that the majority of the hop flavor and aroma were added in the last 10 minutes of the boil. The result is a juicy, fresh, vibrant-smelling and -tasting IPL that will satisfy your every hop craving. Good to have you back, Mink. Next up: Cucurbita Smiles Spiced Pumpkin Lager. Need we say more? This pumpkin beer is an October favorite around here, probably because it tastes like pumpkin pie -- but it's not overpowering. It's a balanced beer with notes of toasty brown sugar, warming cinnamon, nutmeg, and real (read: none o' that fake stuff) vanilla. Look for it in late September/early October. Gulo Cubed will also return this fall. Gulo's big brother, Cubed is smooth and sweet on the palate with enough lupulin to make you get up and do a little dance. It's delicious. It's classic. It's calling your name. Last up, we have a familiar friend with a new vibe. Galaxy Green Thumb (when we used all Galaxy hops in our Session IPL) was so much fun to make, we decided to make a version using all Nelson Sauvin hops. These highly sought-after New Zealand hops impart juicy white wine and fruit notes. Release date of Nelson Sauvin Green Thumb TBD. We have reached a critical point of the summer, guys. It's mid-August, and suddenly we're responsible for purchasing new notebooks and shoes and mechanical pencils because, come on, regular pencils are like so passe. Also on the list of things to do: sit and ruminate, perhaps on a drive to procure said pencils and notebooks, about the lack of sandy blankets in your trunk; the complete absence of potato-salad-induced bloat; the dearth of photographs of you and your friends enjoying cold beverages on softly lit outdoor patios. Where did summer go? Well, we can't throw sand at you or make your grandma's potato salad, but we can at least help you out on the patio-drinking front. Late summer marks more than just golden sunsets and back-to-school shopping -- for us, it marks the return of our World Beer Cup Bronze Medal-winner Raucher Smoked Lager and the introduction of a brand-new brew, Paraiso Fruited Wheat Lager. Additionally, keep your eyes peeled for a new twist on our Green Thumb Session IPL, GALAXY Green Thumb! Also coming up: Big House Brown Lager (if there were ever a sure sign of fall) and Oktoberfest. But those are firmly FALL beers and will receive their very own post. So get your hands on a pint and grab a seat on our patio while you can! You know Raucher. You love Raucher. It is made with German beechwood smoked malt, which imparts rich campfire smoke notes. A well-rounded mash bill gives the beer a comfortable, stable backbone, and German Hallertau Mittelfruh hops give the beer its necessary hop balance. Raucher will return in mid-August! Heard of Galaxy hops recently? These thunder-from-down-under hops (they're from Australia) have been making waves with their big, punchy passionfruit flavor and aroma. They're so fragrant and delicious, we decided to hop our session IPL Green Thumb with them exclusively. The result, Galaxy Green Thumb, is a drool-worthy, ultra-drinkable session beer with tropical notes and juicy passionfruit flavor and aroma. Look for it by late August! Paraiso Fruited Wheat Lager is smooth, drinkable, and decidedly tropical. We're keeping the specific fruit used in Paraiso quiet until closer to release, so stay tuned! Paraiso is lightly hopped with Galaxy hops. It will be released before September -- we'll keep you updated! Summer has arrived, and it's bringing beers with it! Five brews are set to be released in the coming weeks -- four returning favorites, and one classic WSBC brew with a TWIST! Hickory Dickory Bock, West Side Wheat, Eclipser, and P.U.B. Lager are up along with Galaxy Green Thumb! "Wait, what?" you may be asking yourself. "I know about your session IPL Green Thumb, and I know that Galaxy hops as one of the hottest hops on the block these days...are you telling me that we get a session beer brewed with ALL GALAXY HOPS?" Yes, my friend, yes we are. Onto the descriptions! Hickory Dickory Bock features a delicately sweet, malty, and strong flavor typical of bock beers, but with a twist! We lagered this beer on aged hickory, a wood that imparts notes of mesquite, marshmallow, and light smoke to this flavorful brew. A touch of Hallertauer Mittelfruh hops provide bittering balance. Smooth, clean, and flavorful! 5.5% abv, 16 IBUs. Available in July. Eclipser Chestnut Lager is built on a base of Pilsner malt, with coriander, toasted chestnuts, and Michigan wildflower honey rounding out the flavor profile of this complex and drinkable beer. Tettnanger hops provide a bitter foil to the delicate sweetness of this brew. 5.1% abv / 21 IBUs. Release date TBD. P.U.B. Lager, the drinkable, lightly malty beer we brew exclusively for Zingerman's Roadhouse, will be available in the Tap Room starting this summer! This style is based off of English pub ales -- easy-drinking, low-abv brews meant to be enjoyed by the pint. Our version is clean with malt sweetness and is balanced by Northern Brewer hops. 3.8% abv / 24 IBUs. Galaxy Green Thumb is a sweet riff off our our session IPL, Green Thumb. The difference? We hopped Galaxy Green Thumb exclusively with Galaxy hops. This Australian hop variety is much loved and obsessed over due to its extremely distinctive hop aroma -- it's sweet and hugely fragrant with strong notes of passionfruit and citrus. Abv and IBUs forthcoming, as is a release date. West Side Wheat is our wheat-tastic summer beer. Refreshing, bready, and very flavorful, this brew stays in demand from the moment it hits the draft lines to the moment it is, sadly, out for the year. It's oh-so-drinkable, with its bready wheat body complemented by Northern Brewer and Cascade hops. Release date TBD. Five Shores Blonde Lager, our brew benefiting the Alliance for the Great Lakes, returns this weekend! Five Shores Blonde Lager is a blonde common, an amber hybrid. After fermentation, Five Shores was dry-hopped in our hop torpedo with Michigan-grown Cascade hops for a punch of glorious citrus hoppiness. This bright, golden brew's flavorful body is built on a simple, pure foundation of Canadian and American grains that provide a perfect backbone for delicate hop flavor to flow across the palate. We hope it reminds you of the sun flashing off the waters of the Great Lakes and every lake in between with each and every sip. A portion of the proceeds from the sale of Five Shores Blonde goes directly to the Alliance for the Great Lakes, an organization that works to protect, preserve, and sustain the Great Lakes. To learn more about the org, check out their website. June Brew Releases - Bring on the Pilsners! Nothing helps quench thirst during summer heat better than pilsners, and we've got two of 'em coming at you in the month of June: Hoppy favorite Zythgeist Zythos Pilsner makes its return to the draft list, followed by Bärenmarder German Pilsner! Zythgeist: Zythgeist is made with hundreds of pounds of Canadian Pils and rounded out with a touch of darker malt for color and depth of flavor. Where does that name come from, you may ask? Zythgeist is hopped exclusively with a ton of Zythos hops, which impart citrus notes and a hint of pine. It's all about celebrating the current moment and everything about it in the world of craft beer -- tip back a Zythgeist and see what makes it all so special. Bärenmarder: This traditional German-style beer was made with a base of over 97% Pilsen malt with a touch of Melanoidin for color, which results in a light golden brew with plenty of clean, sweet, delicately malty flavor. Bärenmarder was hopped with 100% German Tettnang hops. This hop variety imparts a mild herbal spiciness that works well with the delicate Pilsner base and lends our signature balance to this traditional style. We named this brew Bärenmarder, which is one of the German words for our favorite ferocious mustelid, the wolverine. Stay tuned for specific release dates! Brand-New Beer Release: Cereza Rey! Built on a base of Pils, barley, and chocolate malts, Cereza Rey is a deep, opaque dark brown. Malt and cherry notes greet the nose while roasty malt flavor, creamy smoothness, and Michigan cherry tartness tantalize the taste receptors. And at only 4% abv, this one won't weigh you down! Available NOW in the Tap Room. Apart from a particularly depressing week of unseasonable cold, drizzle, and SNOW, for the love of GOD!, the cold is behind us, and we have made it to the other side of winter. It is now statistically nearly impossible for it to snow again. And it won't...so help us, it won't. April showers bring May flowers, and they also bring more spring beers. But here's the rundown! Next in line is Zythgeist Zythos Pilsner followed by Drag me to Helles Maibock and Verano Mexican-style Amber Lager. Drag me to Helles is our nod to the traditional German Maibock, a highly flavorful sign of spring. Historically, this beer was released in late April/early May and bridged the styles between traditional, lighter bocks and very malty doppelbocks. This beer is characterized by its spicy hop aroma and rich malt flavors -- refreshing, and perfect for the onset of spring. We brew our Maibock to hit the top end of color and hoppiness for the style, bringing you a complex and yet easy drinking German-style lager. We use all German malt and 100% German Hallertau hops. Available Friday, 4/29. Verano Mexican-style Lager is our signature summer beer -- an easy-drinking flavorful amber lager brewed in the style of traditional Mexican lagers. Very refreshing, and best enjoyed with a lime. Available in May! It's our second time brewing Secret City Sticke Altbier, a stronger, darker, more flavorful offshoot of its parent Altbier style. “Sticke,” German for “secret," historically refers to a batch of beer that a brewer over-malted and, in turn, over-hopped to make up for it. Remember, balance is key! This stronger, more flavorful brew would be high in demand, and word of its availability was passed from person to person as a secret. Being in the know made you a hot commodity, and it was something to be proud of! We'll share this one with you, though. Available soon! 40 oz of Freedom Imperial Pilsner, named for the Sublime album of a similar (not the same!) name, is a big whopper of crisp flavor with a big abv to match. Creating such a crisp beer with a higher abv requires a lot of attention during the lagering process, and it's all worth it -- 40 oz of Freedom is smooth and clean with a spicy Pils bite from all Saaz hops. Perfect for cooling down on a hot day (if we ever actually get one of those) or enjoying around a fire. Au Sable Rye Pale Lager (or RyePL, which just seems to roll right off the tongue) is a favorite around here. Made with a spicy rye base, this beer is balanced, smooth, and bursting with citrussy hop flavors from Columbs, Cascade, Warrior, and Falconer's Flight hops. When Au Sable comes around, you know warm weather isn't far behind. 5.5% abv / 59 IBUs. Zythgeist Zythos Pilsner is another hoppy favorite. Zythgeist is made with hundreds of pounds of Canadian Pils and rounded out with a touch of darker malt for color and depth of flavor. Where does that name come from, you may ask? Zythgeist is hopped exclusively with a ton of Zythos hops, which impart citrus notes and a hint of pine. It's all about celebrating the current moment and everything about it in the world of craft beer -- tip back a Zythgeist and see what makes it all so special. 5.7% abv / 46 IBUs. Joining the spring release lineup this year is Raucher, a smoked lager that made some waves at last year's Great American Beer Festival. This is our second time brewing Raucher, and a spring release just seemed perfect. Quickhatch is a bourbon-barrel-aged and fermented brown lager. "Third use" bourbon barrels are employed to impart a delicate bourbon character that's not over the top or particularly boozy -- just enough bourbon to add some warmth and sweetness and allow woodsy barrel flavors to blend into the beer. We brew this and ferment it for a few days before transferring it into these third-use bourbon barrels, where it finishes fermentation and ages all winter at near-freezing temperatures. Come spring, it's time to bust those barrels open and enjoy the soft, subtle malty- and bourbon-sweetness that makes Quickhatch so special. Available soon! Raucher derives its delicate smoke flavor and aroma from beechwood smoked malt, which billows forth in the brew alongside Munich, Vienna, Honey, and Roasted Barley malts. The key to any great smoked beer is balance -- if surrounded by a good, crisp body and enough bitterness to provide a foil to the phenolic smoke, you've got a winner. We use German Hallertau Mittelfreuh hops to provide that balance, and we lager this beer cold and slow for a clean body and beautiful finish. Available soon! Green Thumb is our session IPL -- a perfect lawnmower beer for those spring days spent beautifying the yard or soaking up some Michigan sunlight in a lawn chair. Green Thumb is hopped with Cascade, Columbus, and Hallertau Mittelfrueh hops -- used in tandem, these hops provide a well-rounded amount of flavor and aroma that strikes a perfect balance between citrussy/floral and bitter. Light and smooth in body and finish, Green Thumb's lower abv makes it easy to enjoy a couple while you enjoy these longer days. Available in April. Three favorites return to the Tap Room lineup in time to see the demise of winter and the triumphant return (not that it ever really went away this year) of spring. Keep an eye on the draft board for Secret City Sticke Altbier, Faustian Stout Baltic Porter, and '38 Redemption Schwarzbier -- three distinct styles, each delicious in its own right. This is our second time brewing Secret City Sticke Altbier. At 5.2% abv, this style is stronger than its parent Altbier style. In fact, Sticke Alts are darker, richer, and stronger than typical altbiers. “Sticke,” German for “secret," historically refers to a batch of beer that a brewer over-malted and, in turn, over-hopped to make up for it. Remember, balance is key! This stronger, more flavorful brew would be high in demand, and word of its availability was passed from person to person as a secret. Being in the know made you a hot commodity, and it was something to be proud of! We'll share this one with you, though. Available soon! Chase the rest of the winter chill away with Faustian Stout Baltic Porter, clocking in at 8.5% abv and 33 IBUs. This beer took gold at the 2015 World Expo of Beer! Don’t the let name confuse you. This Baltic porter – a style borrowing from Russian Imperial Stouts and Brown Porters – is rich and complex and yeah, it’s a lager, not a stout. We named ours after Faust, the literary character who traded his soul to the Devil to obtain knowledge and wealth. We made a similar deal to give this rich dark lager the devilishly roasty character it enjoys. The Faustian Stout combines malty sweetness with the aroma of dark, dried fruit, licorice, toffee, and caramel notes. With its higher abv and smooth finish, this beer makes a great sipper. Available soon!